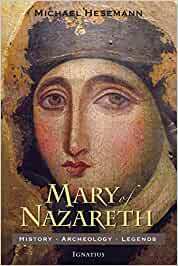 This is the first archaeological and historical biography of the most fascinating and revered woman in history, Mary of Nazareth, the mother of Christ. Millions of faithful around the world invoke her as their Queen, Protectress and Advocate. But who was this extraordinary woman who was chosen by God to give birth to the Saviour? Bestselling author Michael Hesemann searched for her traces in Italy, Israel, Turkey and Egypt. Based on biblical traditions, legends and archaeological discoveries, he reconstructs the life of Mary of Nazareth, the Mother of the Messiah. From the most ancient Icon of Christianity to the Holy House in Loreto, from the Grotto of Nazareth to the refuge of the Holy Family in Egypt, from Mary's residence in Ephesus,Turkey to Mount Zion and her empty tomb in Jerusalem, this is a journey of discovery, full of surprising insights which deepen our faith in the great mystery of the Incarnation. Hesemann takes us on his exciting search for the historical Virgin Mary –a book full of stunning discoveries from the early days of Christianity – and the historical facts behind the worldwide and centuries long devotion to the mother of Jesus. Start reading Mary of Nazareth: History, Archaeology, Legends on your Kindle in under a minute. Chapter 10, Beneath the Cross, which covers Jesus’ Infancy through His death, includes more material from the Gospels, and contains interesting insights. The author clearly loves and respects Mary, which was why I gave the book three stars instead of the two I was at first going to give it. I appreciate this German author’s abhorrence of anti-Semitism. In the middle of the book, there are 14 pages of very high quality colour photographs, excellent reproductions of ancient art and crystal clear photos of ancient churches and other sacred sites; these are the best quality photos I’ve ever seen in a book of this size. But despite the insights in chapter 10, I didn't see much of the real Mary in this book. The author could have gone so much farther in contemplatively exploring what the Gospels themselves show us about who the Mother of Jesus was – and is. He also could have included more of what he expressed disdain for in the very first paragraph of the book: a description of how people lived day-to-day in first century rural Galilee. This would have grounded the book better than all those apocryphal tales and legends did. Fascinating, informative and compelling book. Written in a scholarly manner - not to be read in a few sessions - and worthy of a re-read. In depth research and conclusions that seem to be perfectly reasonable and logical. The writer's determination and efforts to examine ancient texts and review their relationship to Mary and to travel to visit the actual sites that Mary most probably lived are well documented. This book casts light onto the life of Mary, the Blessed Mother, and has deepened my love for and devotion to her. 5.0 out of 5 starsSOMETIMES HARD TO FOLLOW, BUT OVERALL FASCINATING. EXCELLENT PHOTOS. COVERS THE WATERFRONT. VERY, VERY INTERESTING, MODERATELY WELL-WRITTEN, EXCELLENT PHOTOGRAPHS. BEST READ OF ITS KIND SINCE THE BADDE BOOK ON THE MANAPELLO FACE OF CHRIST. Well written book. The author provides much discussion on cultures at the time of the Blessed Mothers life and how events may have been influenced by them.